For many SMBs & SEOs that are new to local search, understanding citations and what’s important about them can be a bit mystifying. On the surface, local directory listings seem as plain as day – how complex can business listings on a website be right?! But once you start getting drawn into the murky world of citations, data aggregators, NAP cleanup etc. it can quickly become confusing. But help is at hand! There are plenty of great tools, guides, videos & research data which help at all stages of the citation process. I have spent countless hours researching, writing about & doing citations – really many more hours than I care to remember! In doing this I have curated or created a number of excellent resources which I have shared below. I hope that this answers all or most of the citation questions you have. How can I learn more about citations & what’s important? What are the best citations sources for local businesses? How can find out where I’m already listed? How do I know if my listings are accurate? Where else can I get myself a listing? What category should I list myself under? Where do citation sites get their data from? How long does it take for listings to go live? How can I learn more about citations? There are literally thousands of useful, informative guides to what citations are & which ones are best. What are the best citation sources? Citation sources come in 6 main shapes & sizes (see below). Some are specific to an industry or city, while some are much broader in scope and provide listings for all types of business in all towns across the country. As long as the site has some relevance to your business (e.g. offers correct category to list or covers same geographic location) and is decent in quality then it’s a goer. How can I find out where I’m already listed? Knowing where you have a listing is an important 1st step in cleaning up your citations so that your NAP is consistent. But it also helps to pin-point gaps in your citation coverage so that you can create new listings in the right places. These 2 tools can automate the process of finding your citations. They scour the web looking for evidence of your business name, address & phone number on 3rd party websites and display this in a handy report. Knowing where you’re listed gives you ½ the picture. To really bring your citation situation into focus you need to know what your business data looks like on these sites. Do they have your business name stored correctly? Do they have your exact address & zip code? Are they using the right local number for your business? You can obviously go to each site in turn and look. But again there are some useful tools to help you work this out without having to go to each site in turn. The 1 drawback of these tools is that they don’t cover every citation site out there, they just cover a few. But knowing the data that these select sites hold about you gives you a sample to draw conclusions about the wider citation set. As well as knowing where you are listed and what data appears on those listings, you also need to know what other sites you can add yourself to. The best way to work this out is to spy on your competitors and see where they’re listed. If your competitors can get a listing on a site it follows that you should – in most cases – also be able to get a listing. The same 2 tools that help you find your existing citations (CitationTracker & CitationFinder) can also be used to spy on your competitors. Both tools show you a list of sites that your competitors are on but you’re not. They even provide the links through to the ‘Get Listing’ page and tell you if a site is free to list on or is a Paid-Listing service. Bill Bean has put together a useful contact list for many of the most important US based citation sites. This shows their twitter handles – bug them via twitter if you have any questions or need to get a listing updated – it’s public and should get a faster/positive reaction if they care! While it’s not critical to know the fine detail of who supplies who with what, it’s useful to be aware of the interrelationships as it can help you determine which sites to submit to directly, and which aggregators to use. These 2 guides provide excellent insight into understanding how data about local businesses gets into the wider world and flows through the local search ecosystem. David Mihm created a short video that explains the different sources of local business data. 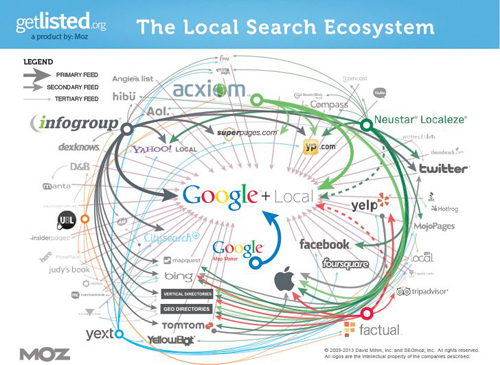 And he also researched & created the Local Search Ecosystem maps. Thanks David – we salute you! What category should I use for my business? Selecting the right category/categories to list your business on aggregator & citation sites is very important. But identifying & selecting the right category can be tricky for some businesses. Moz.com has created a handy category research tool which suggests the best category for you and converts this into the exact category that you need to use on Google, main data aggregators and some important directories. Depending on how you edit or submit your listings the time taken varies. There are also a number of stages which listings pass through before you would consider them a value-adding citation. *These stages are taken from the ‘Speed of data Updates’ research conducted by David Mihm & Mike Blumenthal for getlisted.org in 2012. If you submit listings manually, direct to sites then the speed of go live tends to be much faster than if you submit via a 3rd party or aggregator service. We typically see 70% of our direct submissions go live within 4 weeks of submission, with many going live instantly or in 48-72 hours. Using data-aggregators and 3rd party services that rely on these does take longer because the data has to be processed through their service, then be fed out to each citation site, who then needs to update their database and finally push the new data out on to their website. If you have other resources that use & rely on then please add them to the comments section and we’ll publish them for everyone to benefit from!